Everyone remembers their childhoods and how easy they were. It was easy to run around with friends, create all kinds of mischief and not have to worry about paying the bills or making sure ends are met. Director Sean Baker makes audiences relive some of their childhood memories through “The Florida Project,” a film about the innocence of childhood and how one’s environment and family life have such an enormous impact on it. Taking place in Florida just outside of Disney World, Hailey (Bria Vinaite) and her young daughter Moonee (Brooklyn Pierce) live in a motel. Hailey struggles to pay for rent without a steady job while Moonee finds the joys in life by being mischievous with her friends. 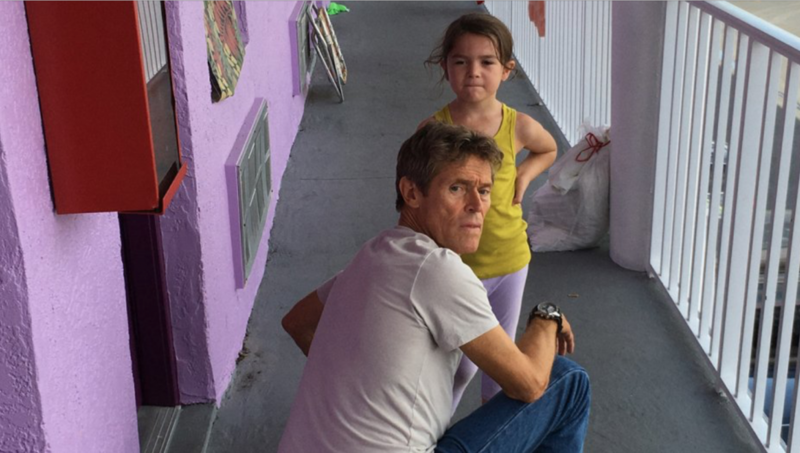 Meanwhile, the hotel’s manager Bobby (Willem Dafoe) does his best to keep the peace by making sure Hailey pays her rent and Moonee is kept out of harm’s way while also letting her be the kid she needs to be. The film is actually much more complex than it appears. From the beginning, a heavy emphasis is placed on how people tend to generalize others based on their income, primarily through Hailey. She struggles to deal with poverty and seems to do the best she can, but her attitude towards taking care of Moonie is too carefree for her own good. She does not see any issues with her daughter spitting on cars or breaking into the electrical room of the motel. It is difficult not to get infuriated over Hailey’s decisions, but at the same time, the film clearly shows that there is more to her than what meets the eye. She is brilliantly played by Vinaite. With this being her first acting role, she is sure to become a well-known actress in the future. Moonee, played by the adorable Pierce, is just as good. Despite only being six years old, she demonstrates an impressive amount of range, with the film showing Moonee’s inability to be afraid of anything when she is having fun with her friends as well as her abject terror when her mother brings a strange man into their room. Little Brooklyn is one of the reasons for the film’s success and she shines in showing us the true innocence of childhood. Bobby is superbly played by Dafoe in one of the most moving performances of his career. He makes it his mission to make sure Hailey pays her rent and when she does not, he does not let it slide. At the same time, he truly cares for her and wants her and Moonee to have a safe place to stay. Dafoe’s performance shows us Bobby’s true colors and makes him one of the more relatable characters in the film. While “The Florida Project” in very minimal in plot, it makes up for it with emotion. It is both heartwarming and heartbreaking, successfully keeping up this balance for its entire two-hour runtime. But what really helps this film stand out is its realism not just in the actions of its leads, but in the world they live in. In no way does this feel like a traditional Hollywood movie, and the film is better for it. This is not one to miss.